I would have been happy with this explanation, however, especially the late sixties Minimalism makes it hard to get into this art movement. The saying "I could have done that!" might be obvious. Minimalism does not want to inspire the viewer by esthetic or artistic mastery, but by the total reduction of the artistic means of expression. Minimalism in visual art is stripped down to its most fundamental features - nothing should distract the beholder. The artist aims to accomplish an absolute uniform perception. Really? 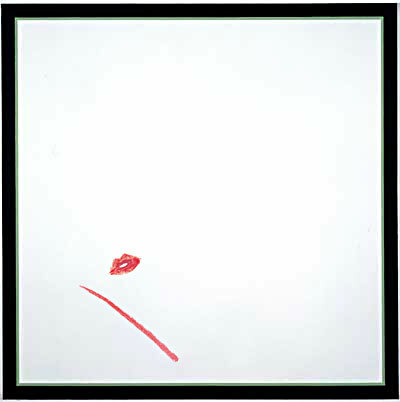 In 1977, Ruth van Herpen kissed a a white monochrome painting by Jo Baer at the Oxford Museum of Modern Art and left a lipstick mark. At court, she explained, “[The work] looked so cold. I only kissed it to cheer it up.” An act of passion or just vandalism? Even in minimalism, it seems, it is not possible to achieve an equalized experience of art..